All our double rooms are en-suite and feature all the usual facilities and requirements; the price includes a Full English Breakfast. 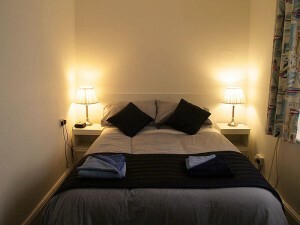 The rooms are warm and inviting, individually decorated to a high standard and come with everything you need to make your stay an enjoyable one. Premium rates apply for Cowes Week / Festival weekends. "After visiting Osbourne House and not finding much there to recommend in the way of eating, we hit upon the Duke of York pub which had basic pub food but the prices were good and the food we got was excellent. Served us well on a cold windy day. plus the local regulars were all as friendly as can be and loved talking to us which sometimes we don't get in local pubs. was a very nice experience." "Went in last night (4th Nov 2012) and ordered the Lamb Roast. What can I say other than Fan-tas-tic!!! Friendly staff, lovely atmosphere and superb service. A really super place to stay or eat...or both! 10/10 +++"
"I have just come back from a holiday in Cowes with my husband and 2 boys, aged 17 months and 9 years. We were staying just round the corner from this pub and went there as a family for an early evening drink and relax most days. Wonderful, character-full pub, super friendly staff and customers, the locals seemed to welcome us with open arms. Food was gorgeous, and such generous portions that we weren't able to test the puddings! Can recommend the steak and ale pie, and the sirloin steak very highly...and the kids loved their pasta and bolognaise, and the chicken curry." Proprietors Barry and Sally Cass are congenial hosts who aim to provide you with comfortable rooms and a quality service at a reasonable price. We have a pleasant restaurant which offers a variety of freshly cooked food. Our new 2018 menu options include several fish dishes for which the Duke is well known and an array of other delicious choices. The Duke of York is now social; therefore, if you're big on Facebook, Twitter or Google+ - then connect with us here for special offers and updates.